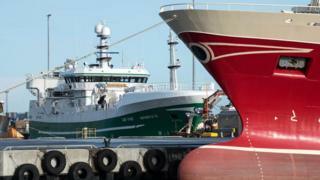 Shetland's fishing industry has a positive future, it has been claimed. Lerwick Port Authority has cited the ongoing construction of a £7.6m replacement white fish market, which is due for completion in 2020. It follows the £16.5m construction of Mair's Quay, the location for the market. Figures for the three months to March showed landed white fish up 7.8% along with a 13% rise in its value compared with the same period in 2017. Sandra Laurenson, chief executive of Lerwick Port Authority, said: "The white fish sector is enjoying a period of robust health, with plentiful stocks, good prices and new fleet investment. "Management of stocks in recent years has resulted in increased stocks and the renewed confidence in the sector is heartening. "While the pelagic processing sector remains squeezed in a weak international marketplace, there is also a positive message, with owners investing around £150m in the Shetland fleet with delivery of five replacement vessels in 2018-19." Brexit: sea of opportunity or discarded overboard?